A second half goal from Mark Lynch helped Derry win through to the Ulster SFC semi-final at Casement Park this afternoon. Lynch netted in the 51st minute after his corner-forward colleague Raymond Wilkinson had teed him up. The Oak Leafers brought star man Paddy Bradley on for the closing ten minutes. Derry were 0-06 to 0-01 ahead before points from Conor McGourty (0-02), Patrick Cunningham (0-02) and Kevin Niblock had the Saffrons level at 0-06 apiece at half-time. Conleth Gilligan and Enda Muldoon moved Derry ahead again before Lynch's goal sent Paddy Crozier's men on the way to a satisfying win. Derry's fifth win in six championship meetings with Antrim was not all plain sailing but Crozier's men do look to have the makings of a team that could end the county's Anglo-Celt Cup drought. Derry have not lifted the Ulster title since 1998 but they looked well poised to make the 15 July final. However, their semi-final opponents Monaghan will certainly be all out for another big win after their surprise win over Down this afternoon. Today's re-fixed tie at Casement could really have gone either way after Antrim fought valiantly to level at 0-06 apiece. Having led the possession stats, Derry hit ten wides in the opening 35 minutes, but you still got the sense that, once they retrained their radars, the spoils would be theirs. Derry's best work of the first half was in the opening 20 minutes. Muldoon shot them in front after only 15 seconds and, while Cunningham quickly replied for the Saffrons, overs from Joe Diver, Muldoon again, Barry McGoldrick, Gilligan and James Conway saw them take a five-point advantage. Prodigious teenager McGourty then ended a 20-minute scoreless spell for the Saffrons as he flighted over two quick points. With free-taker Cunningham and Niblock also getting on target, Antrim were suddenly back on terms. Matters intensified at the start of the second half as Derry's Joe Diver and Paul Doherty of Antrim were booked for their roles in an off-the-ball incident. Derry restarted with a renewed vigour as Gilligan pointed after barely 13 seconds of play. Between the 37th and 50th minutes, Derry added three more points as against a single over from Antrim's Cunningham. Of course Lynch's goal, struck just seconds later, was the most crucial blow of all. Sean McVeigh lost possession following a short kick-out from goalkeeper Sean McGreevey and some quick-thinking saw Wilkinson put in a pin-point hand pass for Lynch to palm the ball to the Antrim net. 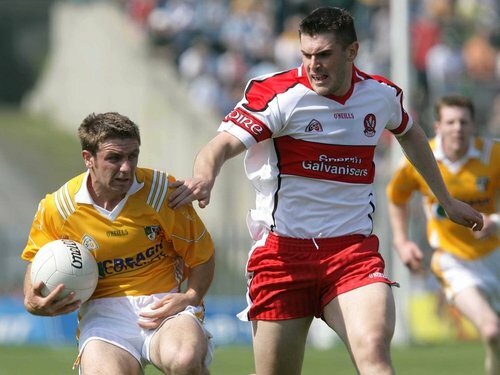 Trailing then by 1-10 to 0-07, Antrim staged a mini-revival with Cunningham, who thumped over a 55-metre free, and McGourty again on target. A free, four minutes from time, from Michael McCann put Antrim into double figures but it was a goal that Jody Gormley's side craved at that stage, and late points from Gilligan and Muldoon put the seal on Derry's victory. 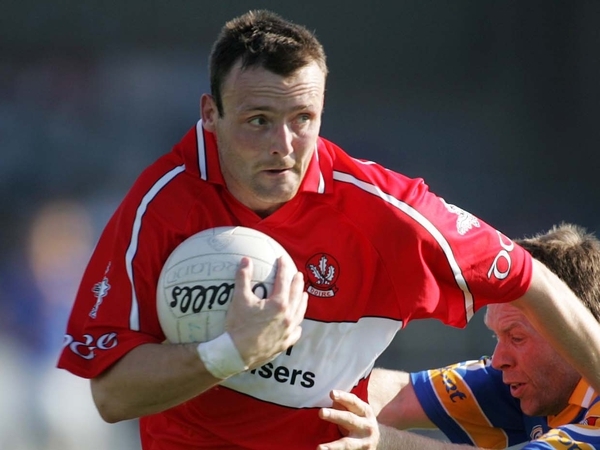 Derry: B Gillis; M McGoldrick, K McCloy, G O'Kane; P Cartin, SM Lockhart, C McKeever; F Doherty, J Conway (0-01); B McGoldrick (0-01), C Gilligan (0-05, 3f), J Diver (0-01); R Wilkinson, E Muldoon (0-04), M Lynch (1-01). Subs used: Patsy Bradley for Cartin, C Devlin for McGoldrick, Paddy Bradley for Diver, L Hinphey for O'Kane. Subs used: E O'Neill for Niblock, C Close for Brady, P Close for O'Boyle.